We've been home for about a day now, and are starting to slowly get onto the right time zone. I was good during our holiday for writing up our adventures as they happened, but processing photos ended up being too much of a hassle. So it's going to take a while to get through the thousands of photos I took over the course of the two weeks we were away. Cool door into one of the old houses. Our second day in Dubai was a full one. We got out pretty early and explored the older part of the city around Dubai Creek over the morning. We explored the souks and spent time on the Creek. In the afternoon and evening we joined a tour that took us out into the desert in Land Cruisers for some dune driving and traditional Arabian entertainment. Wandering through the some of the old, narrow streets in Bur Dubai, approaching a mosque. Unlike yesterday, where our focus was on seeing the city at a macro level on the bus, today we spent more time exploring one specific area of the city, in and around Dubai Creek and the Bur Dubai and Deira neighbourhoods. 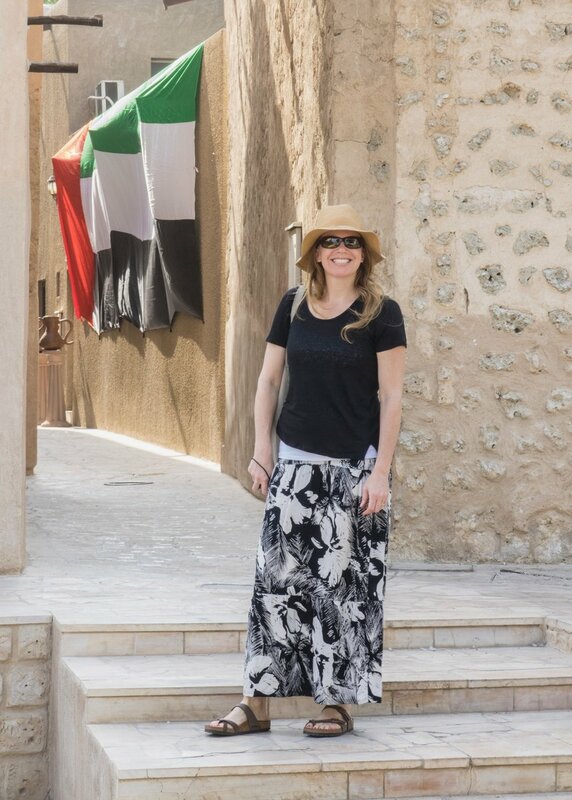 We were up pretty early, and took a taxi over to the the Al Fahidi Historic District in the Bur Dubai neighbourhood. This is one of the oldest areas of the city, and we spent a couple of hours exploring the narrow streets and old buildings. Our guide book had a good Pre planned walking tour, and we used that as a guide to explore. Our wandering eventually brought us to the Dubai Museum, which we skipped because we didn't think we had enough time to really see it. Across the street is the Grand Mosque, which has the tallest minaret in Dubai. As non-Muslims, we couldn't go inside this one, so we continued on exploring the area. We wandered the Bur Dubai Souq, which was mostly textiles and touristy trinkets. One of the older buildings in the area, as we started to explore. One of the many mosques in the area. An amazing little courtyard we found, while exploring. Justine, on our first real day out exploring. There were plumeria trees everywhere. They are one of Justine's favourites. An old sailing ship, on display out front of the Dubai Museum. From there we continued along the waterfront of the Creek. There was an area at the north end that we wanted to explore, including an heritage village, but they turned out to be closed for renovations. We stopped for a late breakfast/early lunch at a local mall to recharge and continued on our way. At the north end of the Creek we found a pedestrian underpass that took us under the Creek from Bur Dubai to Deira. One of the entrances to the Gold Souq. Diera is home to all of the old souqs and was more along the lines of what we had seen in other parts of North Africa when we were in Marrakech a few years ago. We entered the souqs in the Gold Souq, which was something to behold. Shops and shops filled with gold (apparently they buy 300 tons of gold a year) of every description from the ridiculous (a complete gold dress) to the subtle and beautiful. Sadly, it was also filled with guys trying to sell you knock off watches and handbags, and they were relentless. One of the stalls with spices on display. From the Gold Souq, we wandered through narrow winding streets and ended up in the Spice Souq. This one was filled with exotic sights and smells - so many things you just couldn't name! From there we wandered through more narrow streets filled with textiles, cloths and an assortment of goods. Eventually we ended up exiting from the souqs back to the waterfront on the east side of Dubai Creek. Many of the souqs have grand entrances. From there, we headed south down the Creek, checking out the dhows along the waterfront. Dhows are these old wooden trading vessels that they use to distribute goods across the region. Dhows docked along Dubai Creek. A closer view of the dhows. It's hard to imagine the out on the open ocean. The damn things barely look seaworthy, but they were loaded down with a crazy assortment of goods, from tires to refrigerators and flat screen TVs to produce. Electronics, ready to be loaded up and shipped around the region on the dhows. After exploring, we took one of the small wooden abras back across the Creek.This is the main means of commuting across the Creek, and costs 1D (about $0.40) each way. Very cheap and fast. You just have to wait for them to fill up a boat. Abras taking people back across Dubai Creek. Around 1:30, we hoped in a taxi and headed back to our hotel. We had book a desert safari and the company we booked with was going to pick us up at about 3:00. We ended up with a bit of down time in our room before heading down to the lobby to get picked up. We were part of a much larger group - there were 4 other people in our Land Cruiser (a young couple from Australia and two girls from Japan) and when we got out to the desert there were probably 30-40 vehicles in total! The drive out to the desert took about an hour, and we saw lots of interesting sights along the way, including the track where they do camel racing! The track is really big, and we saw groups of camels out on what I have to assume were training runs. Once we got out to the start of the off roading, we stopped to get together as a group, and our driver took a bunch of air from the tires. Then we were off dune bashing! It was pretty fun, going up and down the dunes. At one point our driver was too close to the truck in front of him, and he had to take a sub-optimal route and buried our truck. We all had to get out to lighten the load, and let him work his way out. I think he burned out the clutch in the truck doing so. But at least it wasn't just us! We drove around in the dunes for a while, with a couple of stops to take some pictures and wander on the dunes. We even saw a few gazelle at the start of the drive. The sun disappeared quickly and we headed to the "camp" for dinner. The sun setting on us out in the desert. The camp was actually pretty cool, laid out with low tables that you sat at on cushions. There were a bunch of activities that you could do - camel riding, sand boarding and shisha pipes. Justine got henna tattoos on her hand, which was something she was looking forward to. There's a full "village" set-up in the desert for the evening. Dinner was served not long after we got there - interesting, and very tasty food. There were three full courses, and lots to eat and drink. After dinner there was a local dancing display, and they wrapped up the night by turning off all the lights in the camp to let us "star gaze". It wasn't really dark enough for it to be effective, but it was a good try. Eventually we all piled back into our trucks for the drive back to the city. Justine getting her Henna tattoo. The safari was a bit touristy, but ended up being worth doing the once. The desert is pretty amazing, and is worth seeing. Next time I'd try and find something a little more private, but it was pretty good value. Once we were back at the hotel I went up to the pool for a quick swim to cool off, and get the sand out. It was a nice way to wrap up an amazing day!